I snapped a picture of my friend at a psy-trance club late at night. He was adorned in a big hat in the shape of a wolf head, wore sunglasses and spun led lights in his hands. What was particularly striking about this first image was its inbetweenness: it’s temporary awkwardness. My friend was previously denoted as a quiet, composed and shy person. However, in this new photo, he was lost in dance and appeared transformed. It was clear that this image was a statement. Though it felt out of place now, he was clearly now in the process of establishing a new comfortable identity. This photo suggested that it was not just a whim, but part of a greater transformation that stretched from before the picture was snapped to the future. I am also interested in the way that my friend used his social media profile image to declare that he was no longer the person that his social circle thought he was. I have been working on this conceptual photography project that explores identity change at its first moments of being “declared”. I contacted my friend to collaborate on a series about transformation. For the first part of the photography series, I took a number of black and white portraits of him in his home. For the second part, I asked him to direct me in shooting him, so that I could capture him the way that he saw himself. He asked that I take colour film shots of him spinning fire in the dark. The result was a contrast of how we both understood this in-between period of identity. Mine showed, in square framed black and white, a fellow with scraggly but still new beard, a new shirt imported from Thailand and a crystal hanging from his necklace. His version showed only circular trails of fire. I am currently working on the second part of the project, in which I ask people to draw future tattoos on their bodies with sharpies, along with short story of the tattoos meaning and why they have not committed to it. This liminality – is my departure point. During the Luminous Bodies residency, I will further develop an ongoing conceptual project on visually declaring identity change. I will experiment with film and portraiture to synthesize new ideas from the perspective of this temporary space. My subject is the tenuous space between leaving the security of established social identity and the eventual re-establishment of comfort in a new social milieu. It is a space of confidence, hope, happiness, insecurity and awkwardness. 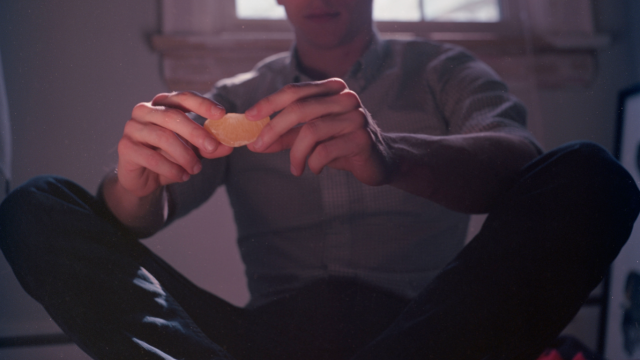 Andrew Weir is a budding photographer who lives and works in Toronto.